Providing you the best range of filter disc for transformer oil filtration service and filter paper packs for transformer oil filtration with effective & timely delivery. 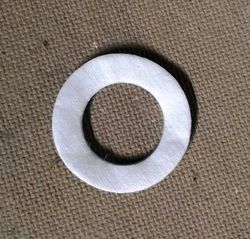 We are among the leading manufacturers and suppliers of washable &Reusable edgeFilter Paper Packs in the industry. The offered edge filter paper packs are extensively utilized for transformer oil filtration and are mounted on aluminum pipes under compressed condition and covered with plastic tubing. These Filter paper packs usec for transformer oil filteration are washable, Reusable and Unbreakable & therefore have long life. Application : Used for Transformer oil. Size: 39 mm OD X 17 mm ID (Standard size); According to clients requirement. These Filter Paper Packs are made form pure cellulose and they give good filteration results. These filter paper packs are used in many electric companies, Power Stations and in many State electricity boards. These Filter Packs are mounted on Alluminun pipes of 35" and covered with plastic tubing to avoid its contact with dust and other foriegn particles. Looking for Transformer Oil Filtration ?